Pham Binh is an Occupy Wall Street activist, socialist, and co-founder of the U.S. left unity project The North Star. 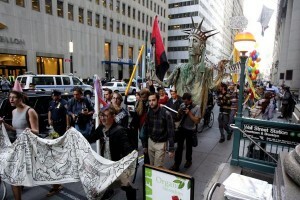 On Monday, thousands converged on New York's financial district to celebrate the one-year anniversary of Occupy Wall Street. Pham Binh reflects on the achievements and mistakes of the past twelve months and argues that far from being a failed experiment, OWS heralds a decade of revolutions and upheavals.